What an amazingly beautiful day, n’est ce pas?! (20 C above normal temperatures – yowza). Breakfast is the most important meal of the day. Yes, it’s a cliche, but I believe it’s true. Your body needs a boost to get you going in the morning. I try to get protein and vegetables into me at every meal, even breakfast. 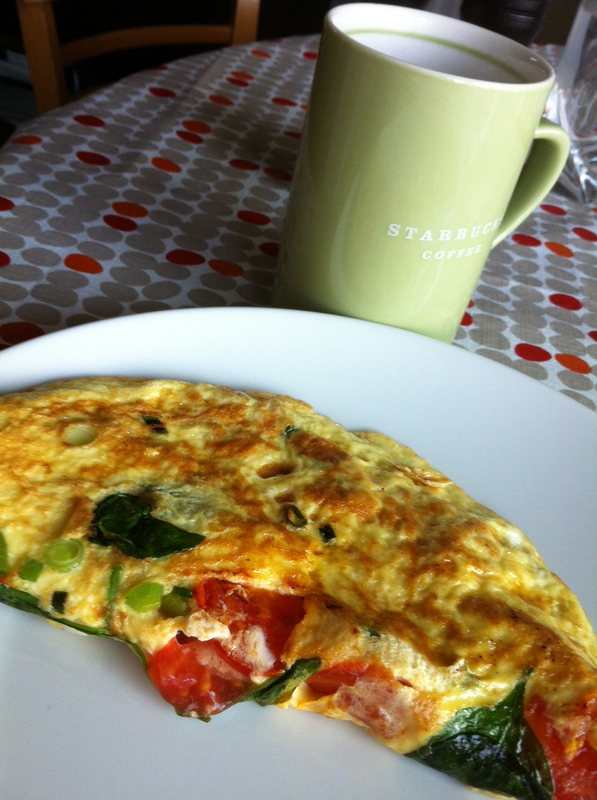 On the days when I’m not running off to school or work, I usually make an omelette. Today was no exception. I briefly sauteed spinach, green onion, raw jalapeño, and tomato, then added 2 organic farm-fresh eggs (yup, they’re Gingerichs‘). I also made my usual “reductionist Americano“. The warm weather gave me a “hankering” for salad, so I dressed some spinach with balsamic vinaigrette (I usually use equal parts balsamic vinegar and extra-virgin olive oil and whisk them together–you probably won’t need more than half a tablespoon of each for one person). 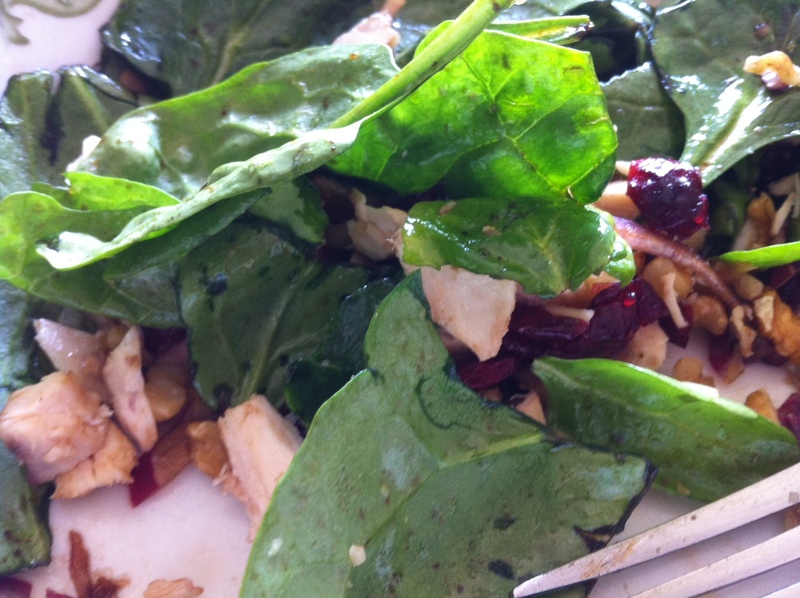 I added slivered red onion, dried cranberries, copped almonds, and some diced roasted chicken. I kept feeling like it was missing something, but other than mandarin oranges, I couldn’t put my finger on it. Still, it was yummy! 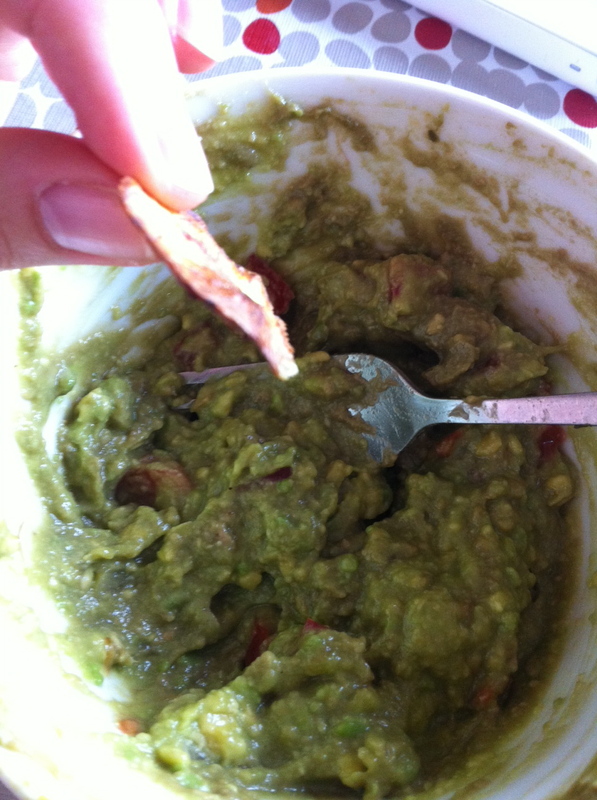 My trusty staple: guacamole. This time, I ate it with the plantain chips I made the other day. They were my second batch, but I still haven’t perfected them. When I do, I’ll tell you about it. Meanwhile, here’s the recipe for those. 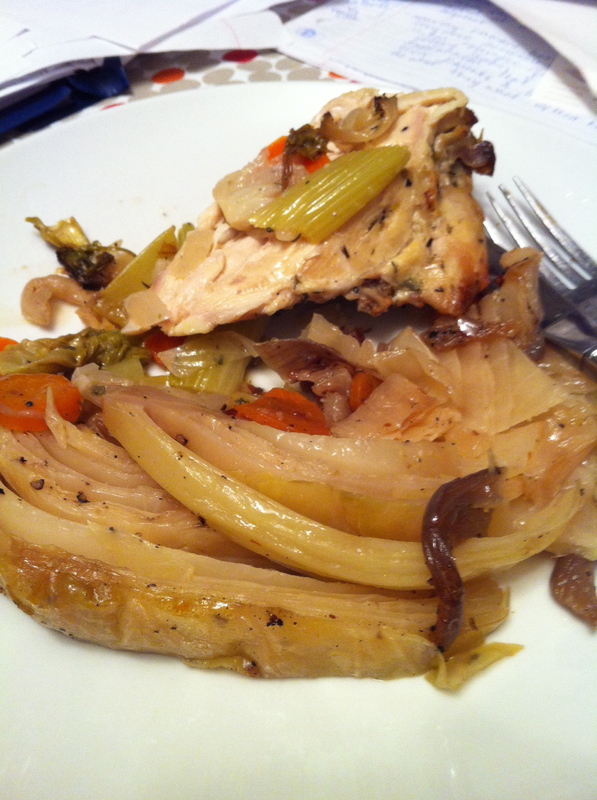 More of that roasted chicken (chicken breast roasted in a glass casserole dish, with chopped carrots, celery, and onions, and the juice and flesh of one lemon, and salt, pepper, dried parsley, and dried thyme to taste), and some leftover braised cabbage… so good! Since I’m still not done the paper that was due yesterday, it’s gonna be a long night. I drank a decaf (black) coffee, and then I got hungry again. 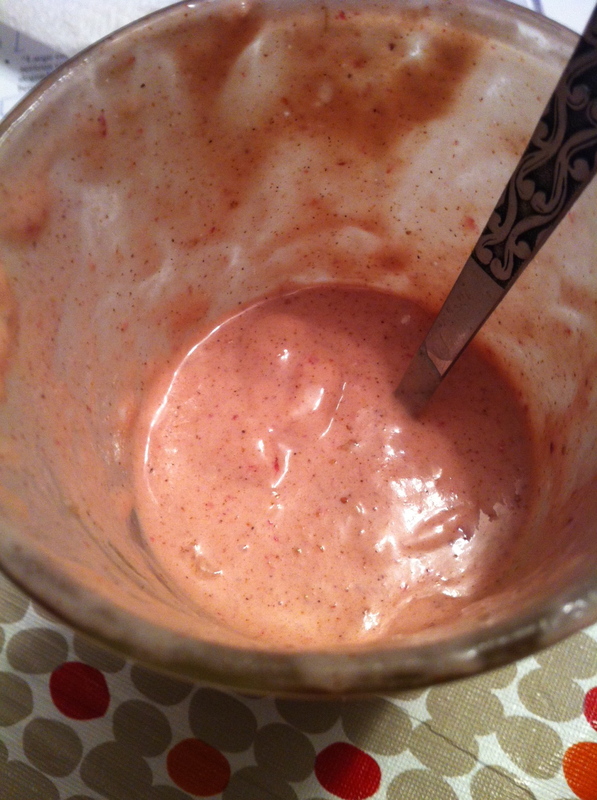 I decided to make a sort of frozen smoothie with coconut milk, almond butter, frozen banana pieces, and frozen strawberries. It took a bit of work to blend with my immersion blender, but it’s worth it! Smooth, cold, creamy, flavourful… mmm!